Musa Abdullah - NIGER DELTAN REPUBLICAN NIGHTMARES! Due to my education, I have been enlightened as to the happenings in Nigeria. We in the North voted for Buhari because he is our brother. We wanted power to return to the North. We knew he cannot fix anything in Nigeria. In our mosques, they always taught us to make sure we remove that infidel call Jonathan. We were meant to hate Jonathan with our spirit, soul and body. Infact, Igbos living in the North were very very lucky. They escaped death by the whiskers through the victory of Baba. Had Baba lost, my brothers where already on standby waiting for instructions to lynch any pig from the South. I was personally in the situation room as things unfold. I felt for the Igbos then. I really pitied them. I knew that my brothers in the North had been brain washed but I dare not speak. I sighed in relief when Baba was declared the winner and my brothers where told to relax, that they should go to the streets and celebrate. That was how the bloodshed was averted to the glory of Allah. I knew something was really wrong with my brothers. Kano gave Buhari the highest vote. It was massively rigged in his favour. That was why the INEC officer in charge of Kano was burnt alive with his family after the election to cover up the rigging. I wept for my people. Now what are we seeing? Baba has abandoned us. My brothers in the North are dying every day of hunger. Prices of things are so high, we can't even eat three square meal a day. My Northern Elders are not worried. They are only after power remaining in the North. Not only that, my concern now is what is about to come. They have already planned on how to deal with the Niger Deltans. Of course you are aware that all the military personnel and weapons have been deployed in Niger Delta. They are planning to use the Leaders of MEND to penetrate the creeks. Their only fear now is that IRAN and Russia are behind the Niger Delta Avengers. They have also contacted Jonathan trying to make him sign an agreement that will further enslave the Niger Deltans but Jonathan refused. So Baba is very angry with Jona and will do everything possible to silence the Niger Delta Avengers. As am typing now, Niger Delta has been rounded up militarily. Magnus Abe, Rotimi Amaechi, APC chairman and the leaders of MEND are in the master plan. As for Biafrans, you people are very lucky. Buhari and my Northern Elders knew that Nnamdi Kanu has already created the awareness for you people. So they are planning now to cut South South out of Biafra so that only the five Eastern states can go with their Biafra. 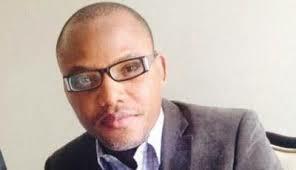 Nnamdi Kanu will soon be released but they want to perfect the exclusion of South South from your Biafra. We know that one Nigeria is just because of Oil. Wallahi, had it been we were the ones with the oil, Nigeria would have divided since. Please let your brothers not protest again because Baba will kill again. Nnamdi Kanu's release is very soon but they are just making sure Niger Delta is cut off from your proposed Biafra. You people should not think that there will be anything like 2019 election, Baba will use Biafra issue as an excuse to postpone the election. South East has already been declared as Biafra, so don't expect any federal government project in your region. You have been written off already.